The Duct Tape Guys are on vacation this month (actually, we are working on a television show). 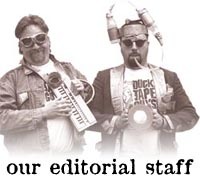 So, you will have to check out previous issues of Duct Tape on a Roll to pass the time - or wander around our massive web site. See you in October! You asked for it - You got it! We've just launced some cool, designer black t-shirts with duct tape pro grunge designs and our popular "Will Duct Tape for Food". Just click to the Duct Tape Pro Shop to pick one up today. Watch for new black shirt designs, soon. Click the image on the left to go directly to our Duct Tape Pro Shop Apparel section.